Yes, our roads are paved ... AND we have the best student drivers under the sun. - Mississippi Believe It! Home » Resources » Campaign » Yes, our roads are paved … AND we have the best student drivers under the sun. Yes, our roads are paved … AND we have the best student drivers under the sun. Who’s running the roads in Mississippi? Teens, of course. But our teens are building their own wheels … and winning titles for it. 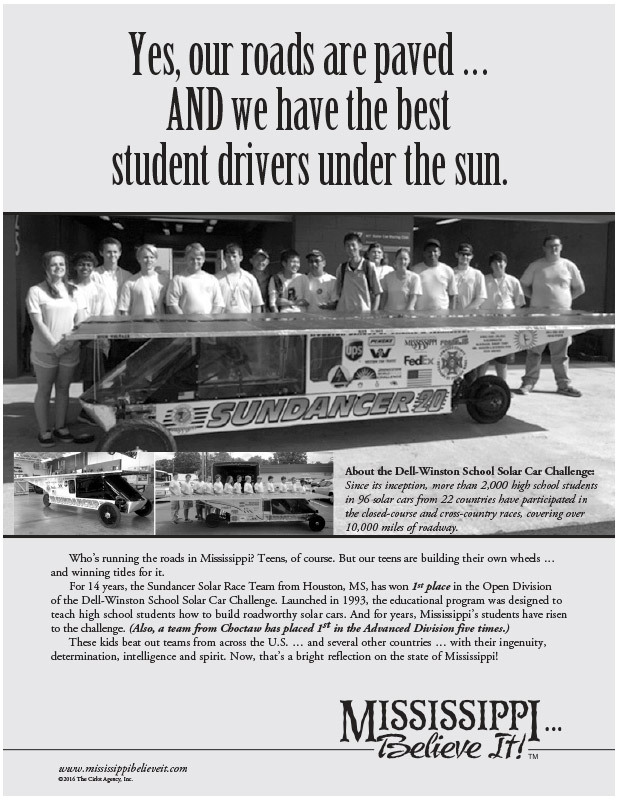 For 14 years, the Sundancer Solar Race Team from Houston, MS, has won 1st place in the Open Division of the Dell-Winston School Solar Car Challenge. Launched in 1993, the educational program was designed to teach high school students how to build roadworthy solar cars. And for years, Mississippi’s students have risen to the challenge. (Also, a team from Choctaw has placed 1st in the Advanced Division five times.) These kids beat out teams from across the U.S. … and several other countries … with their ingenuity, determination, intelligence and spirit. Now, that’s a bright reflection on the state of Mississippi!